Situated in “Woluwe Saint-Pierre”, right next to the Etangs Mellaerts ponds, our brasserie offers a high quality cuisine with seasonal products in a relaxed setting. Enoy delicious dishes with a breath taking view with friends and family or with business partners. Large garden and heated terrace. We also have a private event space available, as well as a cosy smoker’s lounge, indoor and outdoor play den for children. Address: Boulevard du Souverain 275, 1150 Woluwe-Saint-Pierre. Google Maps. Phone number: +32 2 779 36 19. Opening hours: Open from noon to 11pm (until 11pm on Thursday, Friday and Saturday). 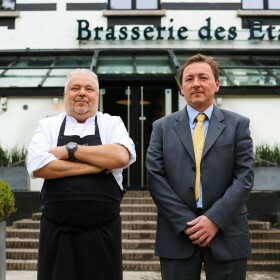 Chef Philippe Hendrickx and manager Jacques represent our brasserie since the opening in 2009. Every single day they succeed to run their teams in such a way they provide the best service and quality.